Rarely is there a movie that immerses the intellect in the intense sensuality of sensational sharp sentences. If you are so inclined, you will drown happily in the witty banter between the characters. 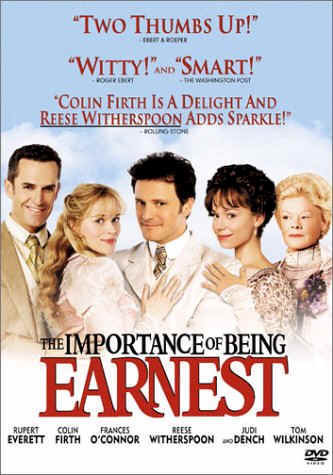 The Importance of Being Earnest is Oscar Wilde’s (1854-1900) final and most cherished play. It opened on February 14, 1895 at the St. James Theatre in London. Wilde's sense of humor and creative genius is fused into a comic masterpiece guaranteed to “produce vibrations.” The wit in this cinematic adaptation is superlative and delves into such ideas as repressed desires and identity. The text has been updated, but the moments of pure splendor are direct quotes from the play. As secrets are unveiled onscreen, the intrigue only increases. You now enter a world drenched in sexual tension, snide humor, country manors with sweeping lawns leading to lakes, crisp lavender letters, spectacular sets, fields of bluebells, intimate and yet expansive English gardens (West Wycombe Park), lavish interiors, staircases decorated with murals by Giuseppe Borgnis, assumed identities, sumptuous costumes and true love. 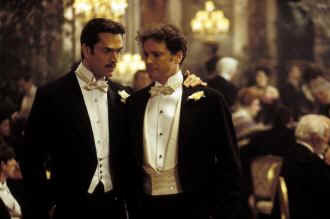 Algernon Moncrieff (Rupert Everett) appears first as he is being chased through the back streets of London by his creditors. You are instantly drawn into the mystery of the moment and desire to find out more about this character. As he displays his talents as a Jazz Pianist, we know there is more to this character than a sheer love for the unfettered life. He seems to have a romantic streak and a devotion to the forbidden. Jack Worthing (Colin Firth) is living a double life and is trying to find his true identity. He adds excitement to his life by assuming different identities. In town he is “Ernest the Bachelor” and in the country “Jack the Provincial Justice of the Peace.” He maintains a bachelor apartment in Albany and a country estate where he has the responsibility of being guardian to Cecily. He escapes to London by train, to enter his own fantasy world where he can flirt recklessly with Gwendolyn Fairfax who has always imagined she would fall in love with a man named Ernest and give him her undying devotion. It is interesting to note that in a world of society drama, audiences enjoyed seeing images of their own aesthetic paradise on display. In the Nineteenth Century, many Englishmen were in fact living the life of “Jack” in the country and “Ernest” in the city. Jack seems to falter in the area of romance on numerous occasions and almost seems locked behind a door of somber decorum. Gwendolyn breaks from her chains in a “metaphysical speculation” moment. She represents the inner desires of all the characters, yet she is the first to take action in the direction of her dreams. You have to love that she travels with her diary so she always has something sensational to read. In the meantime Cecily Cardew (Reese Witherspoon), a sweet country rose, has built up her own fantasy life complete with knights and the desire to be rescued from her prison and her tutor, Miss Prism. She too desires to find a man named Ernest and willingly makes up entries in her diary and even writes herself love letters from her imaginary knight. In her life, “the essence of romance is uncertainty.” Yet, she truly almost dreams her knight into life. The story really centers around two couples and the meddling Aunt Agusta who is absolutely entertaining. Judi Dench perfects the role of Lady Bracknell and had played the part before. As Gwendolen’s mother she assumes the role of protector of her daughters purity and yet she herself realizes that love transcends social barriers. All the characters are living lives in which they at first seem to be escaping vicariously into their fantasies. The true awakening comes when they take action to bring these ideas to fruition. Once Cecily meets Gwendolyn they even read one another’s diaries and give their men a delicious little taunting session that is both cheeky and wicked. Oliver Parker includes a poem by Oscar Wilde as a song in this scene to subtly change the atmosphere from conflict to passion. Wilde was known for his wit and penchant for lilies. He was often seen strolling through Picadilly Circus in London wearing a velvet coat, silk stockings and a lily in hand. As a tribute, men and women wore lilies to the performances in London. Director Oliver Parker has added a beautiful touch of flamboyance to this film. This movie is best viewed with an unprejudiced eye. Perhaps it is true that ”Ignorance is like a delicate exotic fruit; touch it and the bloom is gone.” The less you know about the play the more you might enjoy this film. This movie is a beautiful ripe peach dripping with delicious English wit.